There’s nothing much better than the sound and smells of ocean breezes, drifting off the water though open windows. Scent is an essential accessory to any home, especially a summer house on the water, where sometimes dampness leaves its mark in less idyllic ways. Like many Nantucket houses outside of town, originally meant for seasonal summer living, ours has no basement so I’m always looking for new ways to add a welcoming scent to augment nature’s best and mask the less appealing. I was excited to find an already favorite brand had a new solution. NEST Fragrances new Liquidless Diffuser is such an easy and effortless option. It’s perfect anywhere but especially next to the bed, where things often get knocked over. The open vessel comes with 5 scented sticks infused with pure fragrance oil in a choice of three scents (refills come in 6 options). Each stick lasts a month and since two were more than enough for my bedroom, I have ample for the summer months! I already had several candles throughout the house – mostly Bamboo and Grapefruit but there is a new scent for summer, the light and elegant White Camellia I am adding to my favorites. If you have a large room, consider the statement making 3 wick version. 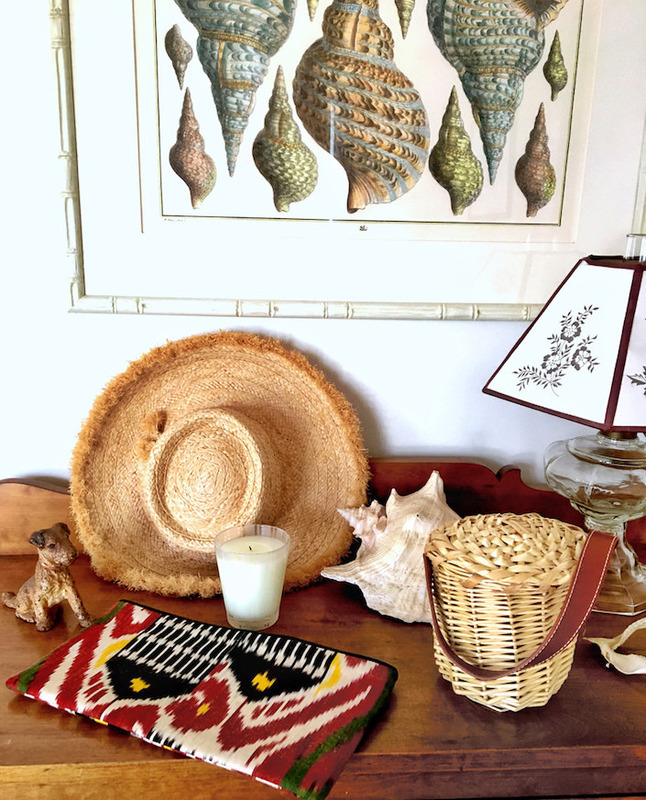 And I have to give a shout out to my favorite summer evening bags – my versatile Madeline Weinrib clutch (in an old style) and new Amanda Lindroth mini Birkin basket, above. In the summer, when I dress more simply, I find that accessories are the best way to update your wardrobe! NEST also keeps me covered in the kitchen and bath. At home in Connecticut, I am obsessed with the Japanese Black Currant liquid soap. 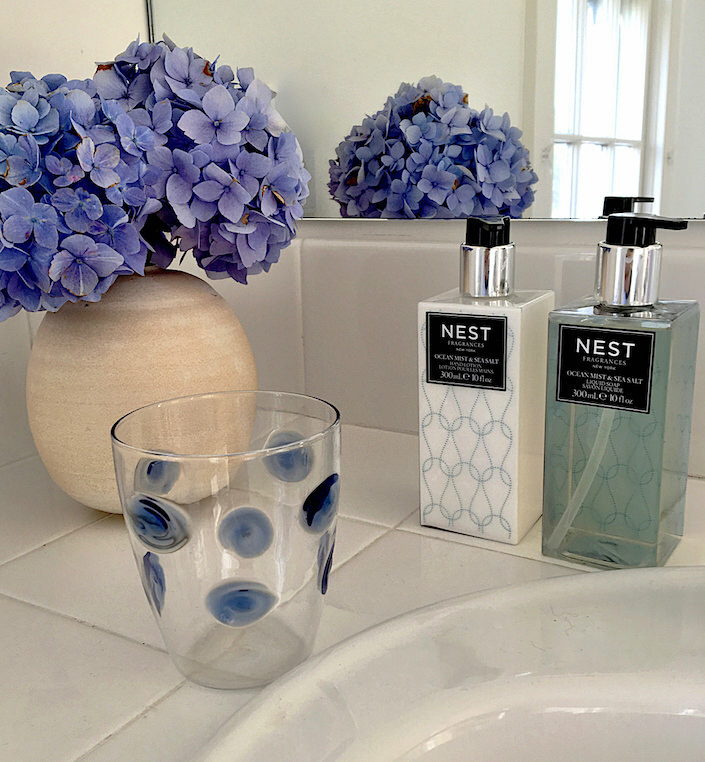 But for a summer house, I suggest what I keep in my kitchen and guest room – the Ocean Mist & Sea Salt. I am on my third set and I think I’ve even gotten video partner Susanna Salk, who was up last weekend for a shoot, hooked on its refreshing coastal scent! This entry posted in gifts, interior design. Entry Tags: candles, NEST Fragrances, scent diffusers Bookmark the permalink. Truly love the photographs–all the details evoking a place and season. I have been considering Nest scents for my little paradise, but your comments on the new diffuser had me shopping for some online yesterday. I’ll be trying the Bamboo. Thanks! Stacey, gorgeous vignettes. But as one of a quite large and growing segment of the population allergic/sensitive to fragrance, I would caution anyone to make sure none of the people who will be visiting share my problem before they scatter neurotoxic petrochemicals throughout their home. There are dehumidifiers and fragrance-free products to absorb dampness and prevent that musty odor some houses are prone to. And, of course, garden flowers can provide beauty as well as fragrance (though some, like paperwhites, can be as overpowering as chemicals). Boiling spices and/or citrus peels can freshen the air without creating a medical emergency for a guest with asthma or other respiratory problems. Just something to think about. 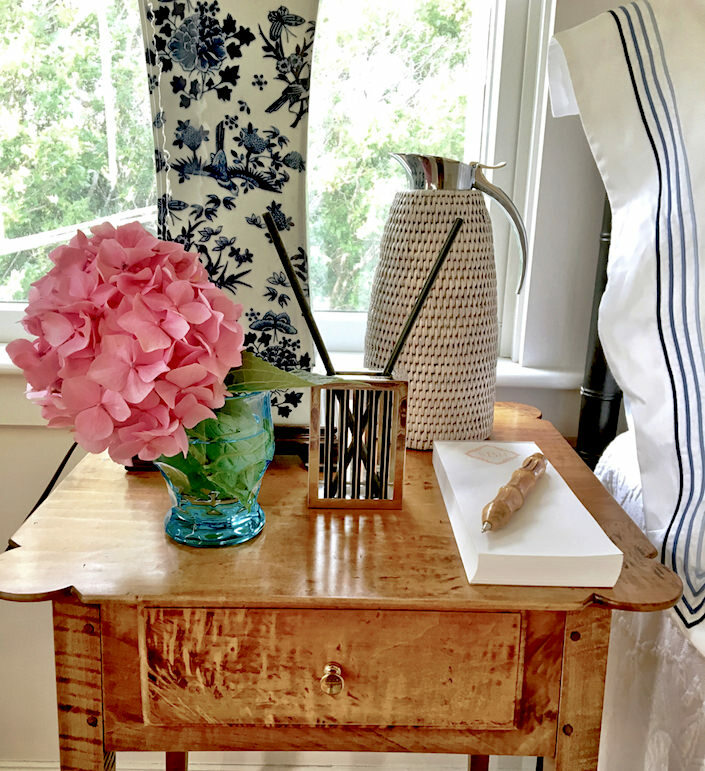 So many lovely things pictured: that bedside table and unusual pen, the sweet little basket bag, the polka dot glass. Just love it when a house is homey and smells really nice! 81 queries in 0.706 seconds.